People who don’t really understand depression have a tendency to think that you should get over it and count your blessings. It can be hard for others to understand depression. They don’t see how someone who seems to have everything can feel an overwhelming sense of sadness. In some cases, it may be hard for you to understand why you are feeling the way you are. You look around and realize you have everything that you want but you still don’t feel the level of happiness that you know should come with your accomplishments. First, you have to understand what depression is. Although many assume that it is mainly about having the blues, the National Institute of Mental Health defines depression as a common but serious mood disorder. It causes severe symptoms that affect how you feel, think, and handle daily activities, such as sleeping, eating, or working. It is important to recognize the signs of depression because as professional women we have a tendency to ignore the signs and continue pushing toward our goals. We often neglect self-care as we climb the ladder to success. However, doing so can be at the expense of our mental health. When we feel empty or sad, we tell ourselves or allow others to tell us to count our blessings and just get over it. But, these symptoms can be signs that there are underlying issues in our lives that need to be dealt with. According to WebMD, in the U.S., about 15 million people experience depression each year. The majority of them are women. Unfortunately, nearly two-thirds do not get the help they need. Up to one in four women is likely to have an episode of major depression at some point in life. 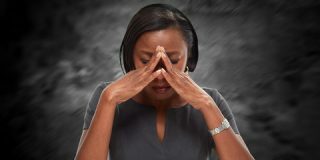 Some experts believe that the increased chance of depression in women may be related to changes in hormone levels that occur throughout a woman’s life. These changes are evident during puberty, pregnancy, and menopause, as well as after giving birth or experiencing a miscarriage. In addition, the hormone fluctuations that occur with each month’s menstrual cycle probably contribute to premenstrual syndrome or PMS, and premenstrual dysphoric disorder, or PMDD — a severe syndrome marked especially by depression, anxiety, and mood swings that occur the week before menstruation and interferes with normal functioning of daily life. What should you do if you think you are suffering from depression? Talk to someone. Although some forms of depression may require medication to restore a chemical imbalance, some cases can be dealt with by speaking to a professional to get to the root of your issues. In order to lead a truly successful life, we have to find peace in all areas of our lives. If not, it will not matter how many titles you attain, how long your resume is, how many designer items are in your closet or how successful others perceive you to be. True happiness comes from within. If you are not feeling it, don’t be embarrassed or ashamed to get help. LaKesha Womack is a Business Owner, Professional Speaker and Published Author. As the Owner and Lead Consultant at Womack Consulting Group, LaKesha provides Business Development, Brand Management, Not for Profit Organization and Political Strategy services to individuals and small business owners. She is also the Founder of #aNote2Self, an online boutique that provides motivational art, tech, home/office décor and apparel. Additionally, LaKesha has published seven books including My Money Matters, a financial literacy workbook series for Kids, Teens, and Adults. She travels throughout the country speaking to audiences of all ages and sizes about personal, professional and spiritual development.